Bitola (/ˈbiːtoʊlə, -tələ/; Macedonian: Битола [ˈbitɔɫa] ( listen) is a city in the southwestern part of the Republic of North Macedonia. It is located in the southern part of the Pelagonia valley, surrounded by the Baba, Nidže and Kajmakčalan mountain ranges, 14 kilometres (9 miles) north of the Medžitlija-Níki border crossing with Greece. The city stands at an important junction connecting the south of the Adriatic Sea region with the Aegean Sea and Central Europe, and is an administrative, cultural, industrial, commercial, and educational centre. It has been known since the Ottoman period as "The City of The Consuls", since many European countries had consulates in Bitola. Градот на конзулите "The City of Consuls"
Bitola is one of the oldest cities on the territory of the Republic of North Macedonia, having been founded as Heraclea Lyncestis in the middle of the 4th century BC by Philip II of Macedon. The city was the last capital of Ottoman Rumelia, from 1836 to 1867. According to the 2002 census, Bitola is the second-largest city in the country. Bitola is also the seat of the Bitola Municipality. The name Bitola is derived from the Old Church Slavonic word ѡ҆би́тѣл҄ь (obitěĺь, meaning "monastery, cloister") as the city was formerly noted for its monastery. When the meaning of the name was no longer understood, it lost its prefix "o-". The name Bitola is mentioned in the Bitola inscription, related to the old city fortress built in 1015 during the ruling of Gavril Radomir of Bulgaria (1014–1015) when Bitola served as capital of the First Bulgarian Empire. Modern Slavic variants include the Macedonian Bitola (Битола), the Serbian Bitolj (Битољ) and Bulgarian Bitolya (Битоля). In Byzantine times, the name was Hellenized to Voutélion (Βουτέλιον) or Vitólia (Βιτώλια), hence the names Butella used by William of Tyre and Butili by the Arab geographer al-Idrisi. The Aromanian name is Bituli. The Greek name for the city (Monastíri, Μοναστήρι), also meaning "monastery", is a calque of the Slavic name. The Turkish name Manastır (Ottoman Turkish: مناستر‎) is derived from the Greek name, as is the Albanian name (Manastir), and the Ladino name (Monastir). Bitola is located in the southwestern part of North Macedonia. The Dragor River flows through the city. Bitola lies at an elevation of 615 meters above sea level, at the foot of Baba Mountain. Its magnificent Pelister mountain (2601 m) is a national park with exquisite flora and fauna, among which is the rarest species of pine, known as Macedonian pine or pinus peuce, as well as a well-known ski resort. Covering an area of 1,798 km2 (694 sq mi). and with a population of 122,173 (1991), Bitola is an important industrial, agricultural, commercial, educational, and cultural center. It represents an important junction that connects the Adriatic Sea to the south with the Aegean Sea and Central Europe. Panorama of Bitola from Krkardaš. Bitola has a mild humid continental climate typical of the Pelagonija region, experiencing warm and dry summers, and cold and snowy winters. The Köppen climate classification for this climate is Cfb, which would be an oceanic climate, going by the original −3 °C (27 °F) threshold. Bitola is very rich in monuments from the prehistoric period. Two important ones are Veluška Tumba, and Bara Tumba near the village of Porodin. From the Copper Age there are the settlements of Tumba near the village of Crnobuki, Šuplevec near the village of Suvodol, and Visok Rid near the village of Bukri. The Bronze Age is represented by the settlements of Tumba near the village of Kanino and the settlement with the same name near the village of Karamani. The area of the town is located in ancient Lynkestis, a region of Upper Macedonia, which was ruled by semi-independent chieftains till the later Argead rulers of Macedon. The tribes of Lynkestis were known as Lynkestai. They were a Greek tribe and belonged to the Molossian group of the Epirotes. There are important metal artifacts from the ancient period at the necropolis of Crkvishte near the village of Beranci. A golden earring dating from the 4th century BC is depicted on the obverse of the Macedonian 10-denar banknote, issued in 1996. Heraclea Lyncestis (Ancient Greek: Ἠράκλεια Λυγκηστίς - City of Hercules upon the Land of the Lynx) was an important settlement from the Hellenistic period till the early Middle Ages. It was founded by Philip II of Macedon by the middle of the 4th century BC, and named after the Greek hero Heracles. With its strategic location, it became a prosperous city. The Romans conquered this part of Macedon in 148 BC and destroyed the political power of the city. However, its prosperity continued mainly due to the Roman Via Egnatia road which passed near the city. Several monuments from the Roman times remain in Heraclea, including a portico, thermae (baths), an amphitheater and a number of basilicas. The theatre was once capable of housing an audience of around 3,000 people. In the early Byzantine period (4th to 6th centuries AD) Heraclea was an important episcopal centre. Some of its bishops were mentioned in the acts of the Church Councils, including Bishop Evagrius of Heraclea in the Acts of the Sardica Council of 343. A small and a great (Large) basilica, the bishop's residence, and a funeral basilica near the necropolis are some of the remains of this period. Three naves in the Great Basilica are covered with mosaics of very rich floral and figurative iconography; these well preserved mosaics are often regarded as fine examples of the early Christian art period. During the 4th and 6th centuries, the names of other bishops from Heraclea were recorded. The city was sacked by Ostrogothic forces, commanded by Theodoric the Great in 472 and, despite a large gift to him from the city's bishop, it was sacked again in 479. It was restored in the late 5th and early 6th centuries. In the late 6th century the city suffered successive attacks by Slavic tribes and was gradually abandoned. In the 6th and 7th centuries, the region around Bitola experienced a demographic shift as more and more Slavic tribes settled in the area. In place of the deserted theater, several houses were built during that time. The Slavs also built a fortress around their settlement. Bitola became a part of the First Bulgarian Empire from middle the 8th to early 11th centuries. The spread of Christianity was assisted by St. Clement of Ohrid and Naum of Preslav in the 9th and early 10th centuries. Many monasteries and churches were built in the city. In the 10th century, Bitola was under the rule of the Bulgarian Tsar Samuil. He built a castle in the town, later used by his successor Gavril Radomir of Bulgaria. The town is mentioned in several medieval sources. John Skylitzes's 11th-century chronicle mentions that Emperor Basil II burned Gavril's castles in Bitola, when passing through and ravaging Pelagonia. The second chrysobull (1019) of Basil II mentioned that the Bishop of Bitola depended on the Archbishopric of Ohrid. During the reign of Samuil, the city was an important centre in the Bulgarian state and the seat of the Bitola Bishopric. In many medieval sources, especially Western, the name Pelagonia was synonymous with the Bitola Bishopric, and in some of them Bitola was known under the name of Heraclea due to the church tradition that turned the Heraclea Bishopric into the Pelagonian Metropolitan's Diocese. In 1015, Tsar Gavril Radomir was killed by his cousin Ivan Vladislav, who declared himself tsar and rebuilt the city fortress. To celebrate the occasion, a stone inscription written in the Cyrillic alphabet was set in the fortress; in it the Slavic name of the city is mentioned: Bitol. Following battles with the Tsar Ivan Vladislav, Byzantine emperor Basil II recaptured Monastiri in 1015. The town is mentioned as an episcopal centre in 1019 in a record by Basil II. Two important uprisings against Byzantine rule took place in the Bitola area in 1040 and 1072. After the Bulgarian state was restored in the late 12th century, Bitola was incorporated under the rule of Tsar Kaloyan of Bulgaria. It was conquered again by Byzantium at the end of the 13th century, but it became part of Serbia in the first half of the 14th century, after the conquests of Stefan Dušan. As a military, political and cultural center, Bitola played a very important role in the life of the medieval society in the region, prior to the Ottoman conquest in the mid-14th century. On the eve of the Ottoman conquest, Bitola (Monastir in Ottoman Turkish) experienced great growth with its well-established trading links all over the Balkan Peninsula, especially with big economic centers like Constantinople, Thessalonica, Ragusa and Tarnovo. Caravans of various goods moved to and from Bitola. From 1382 to 1912, Manastır (now Bitola) was part of the Ottoman Empire. Fierce battles took place near the city during the arrival of Ottoman forces. Ottoman rule was completely established after the death of Prince Marko in 1395 when Ottoman Empire established the Sanjak of Ohrid as a part of the Rumelia Eyalet and one of earliest established sanjaks in Europe. Before it became part of the Ottoman Empire in 1395 its initial territory belonged to the realm of Prince Marko. Initially its county town was Bitola and later it was Ohrid, so it was initially sometimes referred to as Sanjak of Monastir or Sanjak of Bitola. After the Austro-Ottoman wars, the trade development and the overall prosperity of the city was stifled. But in the late 19th century, it again it became the second-largest city in the wider southern Balkan region after Salonica. In 1874, Manastır became the center of Monastir Vilayet which included the sanjaks of Debra, Serfidze, Elbasan, Manastır (Bitola), Görice and towns of Kırcaova, Pirlepe, Florina, Kesriye and Grevena. Traditionally a strong trading center, Bitola is also known as "the city of the consuls". In the final period of the Ottoman rule (1878-1912), Bitola had consulates from twelve countries. During the same period, there were a number of prestigious schools in the city, including a military academy that, among others, was attended by the Turkish reformer Mustafa Kemal Atatürk. Bitola was also the headquarters of many cultural organizations that were established at that time. There are opposing ethnographic data from that period, but it appears that no specific ethnic or religious group could claim an absolute majority of the population. According to the 1911 Ottoman census, Greeks were the largest Christian population in the vilayet., with 740,000 Greeks, 517,000 Bulgarians and 1,061,000 Muslims in the vilayets of Selanik (Thessaloniki) and Manastır. The basis of the Ottoman censuses was the millet system. People were assigned an ethnicity according to their religion. So all Sunni Muslims were categorised as Turks, although many of them were Albanians, and all members of the Greek Orthodox church as Greeks, although their numbers included a vast majority of Aromanians and South Albanians. The Slavs were divided between Bulgarian majority and small Serbian minority. Bitola’s population itself was greatly diverse. It numbered some 50,000 at the end of the 19th century. There were around 7,000 Aromanians most of whom fully embraced the Hellenist ideas, although many of them joined the Romanian idea. Bitola also had significant Muslim population - 11,000 (Turks, Roma, and Albanians) as well Jewish commununity - 5,200. The Slavic-speakers were divided between the Bulgarian Exarchate - 8,000, and the Greek Patriarchate - 6,300. In 1894, Manastır was connected with Selanik by train. The first motion picture made in the Balkans was recorded by the Aromanian Manakis brothers in Manastır in 1903. In their honour, the annual Manaki Brothers International Film Camera Festival is held in modern Bitola. 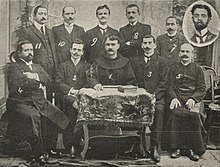 In November 1905, the Secret Committee for the Liberation of Albania, a secret organization to fight for the liberation of Albania from the Ottoman Empire, was founded by Bajo Topulli and other Albanian nationalists and intellectuals. Three years later, the Congress of Manastir of 1908 which defined the modern Albanian alphabet was held in the city. The congress was held at the house of Fehim Zavalani and led by Mit'hat Frashëri, chairman of the congress. The participants in the Congress were prominent figures of the cultural and political life from Albanian-inhabited territories in the Balkans, as well as throughout the Albanian diaspora. The Bitola region was a stronghold of the Ilinden Uprising. The uprising was conceived in 1903 in Thessaloniki by the Internal Macedonian Revolutionary Organization (IMRO). The uprising in the Bitola region was planned in Smilevo village in May 1903. The battles were fought in the villages of Bistrica, Rakovo, Buf, Skocivir, Paralovo, Brod, Novaci, Smilevo, Gjavato, Capari and others. Smilevo was defended by 600 rebels led by Dame Gruev and Georgi Sugarev, but when they were defeated, the villages were burned. In 1912, Montenegro, Serbia, Bulgaria and Greece fought the Ottomans in the First Balkan War. After victory at Sarantaporo, Greek troops advanced towards Monastir but were defeated by the Ottomans at Sorovich. The Battle of Monastir (16–19 November 1912) led to Serbian occupation. According to the Treaty of Bucharest, 1913, the region of Macedonia was divided into three parts between Greece, Serbia and Bulgaria, with Monastir ceded to Serbia, given the name Bitola. German Vivat ribbon commemorating the Bulgarian occupation (1915). During World War I Bitola was on the Salonica Front. Bulgaria, a Central Power, took the city on 21 November 1915, while the Allied forces recaptured it in 1916. Bitola was divided into French, Russian, Italian and Serbian sections, under the command of French general Maurice Sarrail. Until Bulgaria's surrender in late autumn 1918, Bitola remained a front line city and was bombarded almost daily by air bombardment and artillery fire and was nearly destroyed. At the end of World War I Bitola was restored to the Kingdom of Serbia, and, consequently, became part in 1918 of the Kingdom of Serbs, Croats and Slovenes, renamed Yugoslavia in 1929. Bitola became one of the major cities of the Vardarska banovina. During the World War II (1941–45), the Germans (on 9 April 1941) and later Bulgarians (on 18 April 1941) took control of the city. But in September 1944, Bulgaria switched sides in the war and withdrew from Yugoslavia, and Bitola was freed by Yugoslav Partisans. On 4 November, the 7th Macedonian Liberation Brigade entered Bitola victoriously. A historical Jewish community, of Sephardic origin, lived in the city until World War II, when most were killed or migrated to the United States and Chile. After the end of the war, a Macedonian state was established for the first time in modern history, within Yugoslavia. The war had caused 25,000 deaths in the city area. In 1945, the first Gymnasium (named "Josip Broz Tito") to use the Macedonian language, was opened in Bitola. The city has many historical building dating from many historical periods. The most notable ones are from the Ottoman age, but there are some from the more recent past. Širok Sokak (Macedonian: Широк Сокак, meaning "Wide Alley") is a long pedestrian street that runs from Magnolia Square to the City Park. It is unknown when Bitola's clock tower was built. Written sources from the 16th century mention a clock tower, but it is not clear if it is the same one. Some believe it was built at the same time as St. Dimitrija Church, in 1830. Legend says that the Ottoman authorities collected around 60,000 eggs from nearby villages and mixed them in the mortar to make the walls stronger. The tower has a rectangular base and is about 30 meters high. Near the top is a rectangular terrace with an iron fence. On each side of the fence is an iron console construction which holds the lamps for lighting the clock. The clock is on the highest of three levels. The original clock was replaced during World War II with a working one, given by the Nazis because the city had maintained German graves from World War I. The massive tower is composed of walls, massive spiral stairs, wooden mezzanine constructions, pendentives and the dome. During the construction of the tower, the façade was simultaneously decorated with simple stone plastic. The Church of Saint Demetrius was built in 1830 with voluntary contributions of local merchants and craftsmen. It is plain on the outside, as all churches in the Ottoman Empire had to be, but lavishly decorated with chandeliers, a carved bishop throne and an engraved iconostasis on the inside. According to some theories, the iconostasis is a work of the Mijak engravers. Its most impressive feature is the arc above the imperial quarters with modeled figures of Jesus and the apostles. Other engraved wood items include the bishop's throne made in the spirit of Mijak engravers, several icon frames and five more-recent pillars shaped like thrones. The frescoes originate from two periods: the end of the 19th century, and the end of World War I to the present. The icons and frescoes were created thanks to voluntary contributions of local businessmen and citizens. The authors of many of the icons had a vast knowledge of iconography schemes of the New Testament. The icons show a great sense of color, dominated by red, green and ochra shades. The abundance of golden ornaments is noticeable and points to the presence of late-Byzantine artwork and baroque style. The icon of Saint Demetrius is signed with the initials "D. A. Z. ", showing that it was made by iconographer Dimitar Andonov the zograph in 1889. There are many other items, including the chalices made by local masters, a darohranilka of Russian origin, and several paintings of scenes from the New Testament, brought from Jerusalem by pilgrims. The opening scenes of the film The Peacemaker were shot in the "St. Dimitrija" church in Bitola, as well as some Welcome to Sarajevo scenes. Heraclea Lyncestis (Macedonian: Хераклеа Линкестис) was an important ancient settlement from the Hellenistic period till the early Middle Ages. It was founded by Philip II of Macedon by the middle of the 4th century BC. Today, its ruins are in the southern part of Bitola, 2 km (1 mi) from the city center. Situated near the city centre, the covered bazaar (Macedonian: Bezisten, Безистен) is one of the most impressive and oldest buildings in Bitola from the Ottoman period. With its numerous cupolas that look like a fortress, with its tree-branch-like inner streets and four large metal doors it is one of the biggest covered markets in the region. It was built in the 15th century by Kara Daut Pasha Uzuncarsili, then Rumelia's Beylerbey. Although the bazaar appears secure, it has been robbed and set on fire, but has managed to survive. The Bezisten, from the 15th to the 19th centuries, was rebuilt, and many stores, often changing over time, were located there. Most of them were selling textile and other luxurious fabrics. At the same time the Bezisten was a treasury, where in specially made small rooms the money from the whole Rumelian Vilaet was kept, before it was transferred into the royal treasury. In the 19th century the Bezisten held a total of 84 shops. Today most of them are contemporary and they sell different types of products, but despite the internal renovations, the outwards appearance of the structure has remained unchanged. The Gazi Hajdar Kadi Mosque is one of the most attractive monuments of Islamic architecture in Bitola. It was built in the early 1560s, as the project of the architect Mimar Sinan, ordered by the Bitola kadija Ajdar-kadi. Over time, it was abandoned and heavily damaged, and at one point used as a stare, but recent restoration and conservation has restored to some extent its original appearance. The Jeni Mosque is located in the center of the city. It has a square base, topped with a dome. Near the mosque is a minaret, 40 m high. Today, the mosque's rooms house permanent and temporary art exhibitions. Recent archaeological excavations have revealed that it has been built upon an old church. The Ishak Çelebi Mosque is the inheritance of the kadi Ishak Çelebi. In its spacious yard are several tombs, attractive because of the soft, molded shapes of the sarcophagi. The old bazaar (Macedonian: Стара Чаршија) is mentioned in a description of the city from the 16th and the 17th centuries. The present bezisten does not differ much in appearance from the original one. The bezisten had eighty-six shops and four large iron gates. The shops used to sell textiles, and today sell food products. The Deboj Bath is a Turkish bath (hamam). It is not known when exactly it was constructed. At one point, it was heavily damaged, but after repairs it regained its original appearance: a façade with two large domes and several minor ones. Bitola is the economic and industrial center of southwestern North Macedonia. Many of the largest companies in the country are based in the city. The Pelagonia agricultural combine is the largest producer of food in the country. The Streževo water system is the largest in the Republic of North Macedonia and has the best technological facilities. The three thermoelectric power stations of REK Bitola produce nearly 80% of electricity in the state. The Frinko refrigerate factory was a leading electrical and metal company. Bitola also has significant capacity in the textile and food industries. Bitola is also home to thirteen consulates, which gives the city the nickname "the city of consuls." Italy has also expressed interest in opening a consulate in Bitola. There is only one television station in Bitola: Vena, two regional radio stations: the private Radio 105, Aktuel Bombarder and Radio Delfin as well as a local weekly newspaper — Bitolski Vesnik. The Bitola Municipality Council (Macedonian: Совет на Општина Битола) is the governing body of the city and municipality of Bitola. The city council approves and rejects projects that would have place inside the municipality given by its members and the Mayor of Bitola. The Council consists of elected representatives. The number of members of the council is determined according to the number of residents in the community and can not be fewer than nine nor more than 33. Currently the council is composed of 31 councillors. Council members are elected for a term of four years. Examining matters within its competence, the Council set up committees. Council committees are either permanent or temporary. The most popular sports in Bitola are football and handball. The main football team is FK Pelister and they play at the Tumbe Kafe Stadium which has a capacity of 8,000. Gjorgji Hristov, Dragan Kanatlarovski, Toni Micevski, Nikolče Noveski, Toni Savevski and Mitko Stojkovski are some of the Bitola natives to start their careers with the club. The main handball club and most famous sports team from Bitola is RK Pelister. RK Bitola is the second club from the city and both teams play their games at the Sports Hall Mladost. In the Macedonian Second League, FK Novaci are competing, which is located in the Region of Bitola. All the sports teams under the name Pelister are supported by the fans known as Čkembari. Bitola is a bishopric city and the seat of the Diocese of Prespa- Pelagonia. 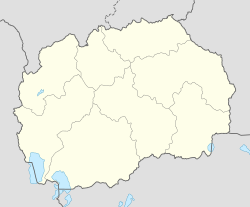 In World War II the diocese was named Ohrid - Bitola. With the restoration of the autocephaly of the Macedonian Orthodox Church in 1967, it got its present name Prespa- Pelagonia diocese which covers the following regions and cities: Bitola, Resen, Prilep, Krusevo and Demir Hisar. The first bishop of the diocese (1958 - 1979) was Mr. Kliment. The second and current bishop and administrator of the diocese, who has been bishop since 1981 is Mr. Petar. The Prespa- Pelagonia diocese has about 500 churches and monasteries. In the last ten years in the diocese have been built or are being built about 40 churches and 140 church buildings. The diocese has two church museums- the cathedral "St. Martyr Demetrius" in Bitola and at the Church "St. John" in Krusevo and permanent exhibition of icons and libraries in the building of the seat of the diocese. The seat building was built between 1901 and 1902 and is an example of baroque architecture. Besides the dominant Macedonian Orthodox Church in Bitola there are other major religious groups such as the Islamic community, the Roman Catholic Church and others. Bitola's Cathedral of the Sacred Heart of Jesus is the co-cathedral of the Roman Catholic Diocese of Skopje. Bitola has been part of the UNESCO Creative Cities Network since December 2015. The Manaki festival is the oldest film festival in the world .In memories of the first cameramen on the Balkans, Milton Manaki, every September the Film and Photo festival "Brothers Manaki" takes place. It is a combination of documentary and full-length films that are shown. The festival is a world class event with high recognition from press. A number of high profile actors such as Catherine Deneuve, Isabelle Huppert, Victoria Abril, Predrag Manojlovic, Michael York, Juliette Binoche, and Rade Sherbedgia have attended. Every year, the traditional folk festival "Ilinden Days" takes place in Bitola. It is a 4-5 day festival of music, songs, and dances that is dedicated to the Ilinden Uprising against the Turks, where the main concentration is placed on the folk culture of North Macedonia. Folk dances and songs are presented with many folklore groups and organizations taking part . In the last few years, the art exhibition "Small Monmartre of Bitola" that is organized by the art studio "Kiril and Metodij" has turned into a successful children's art festival. Children from all over the world come to create art, making a number of highly-valued art pieces that are presented in the country and around the world. "Small Monmartre of Bitola" has won numerous awards and nominations. Bitolino is an annual children's theater festival held in August with the Babec Theater. Every year professional children's theaters from all over the world participate in the festival. The main prize is the grand prix for best performance. Every May, Bitola hosts the international children's song festival Si-Do, which in recent years has increased in attendance. Children from all over Europe participate in this event which usually consists of about 20 songs. This festival is supported by ProMedia which organizes the event with a new topic each year. Many Macedonian musicians have participated in the festival including: Next Time and Karolina Goceva who also represented North Macedonia at the Eurovision Song Contest. Interfest is an international festival dedicated mainly to classical music where musicians from around the world play their classical pieces. In addition to the classical music concerts, there are also few nights for pop-modern music, theater plays, art exhibitions, and a day for literature presentation during the event. In the last few years there have been artists from Russia, Slovakia, Poland, and many other countries. As Bitola has been called the city with most pianos, one night of the festival is dedicated to piano competitions. One award is given for the best young piano player, and another for competitors over 30. The Akto Festival for Contemporary Arts is a regional festival. The festival includes visual arts, performing arts, music and theory of culture. The first Akto festival was held in 2006. The aim of the festival is to open the cultural frameworks of a modern society through "recomposing" and redefining them in a new context. In the past, the festival featured artists from regional countries like Slovenia, Greece or Bulgaria, but also from Germany, Italy, France and Austria. Is annual festival of monodrama held in April in organization of Centre of Culture of Bitola every year many actors from all over the world come in Bitola to play monodramas. Is a cultural and tourist event which has existed since 2007. The founder and organizer of the festival is the Association of Citizens Center for Cultural Decontamination Bitola. The festival is held every year in mid-July in the heart of the old Turkish bazaar in Bitola, as part of Bitola Cultural Summer Bit Fest. Hotel Epinal in the centre of Bitola, named after the French city of Épinal, a twin town of Bitola. In return, a quarter in the city of Épinal is called Bitola, and a North Macedonian flag is flown there. Ajri Demirovski (Macedonian: Ајри Демировски, Turkish: Hayri Önder) (born 1927 in Bitola (Monastiri), died 2009 in Turkey) was an ethnic Turkish singer. ^ "Saint Nectarios of Bitola proclaimed new city patron. (26-01-2008)". www.vecer.com.mk (in Macedonian). ^ "Bitola Climate Normals 1961–1990". National Oceanic and Atmospheric Administration. Retrieved March 22, 2015. ^ "Klimatafel von Bitola / Mazedonien" (PDF). Baseline climate means (1961-1990) from stations all over the world (in German). Deutscher Wetterdienst. Retrieved February 14, 2016. ^ Hammond, Nicholas Geoffrey Lemprière (1993). Collected Studies: Further studies on various topics. A.M. Hakkert. p. 158. ^ National Bank of the Republic of Macedonia. Macedonian currency. Banknotes in circulation: 10 Denars Archived 2008-03-29 at the Wayback Machine. – Retrieved on 30 March 2009. ^ Durham M., Edith. "Twenty Years Of Balkan Tangle". Gutenberg.org. ^ "Serbian propaganda in Monastir was, however, then only in its infancy, and nothing but very elementary school books were to be got. The Bulgars had a big school and church. If any one had suggested that Monastir was Serb or ever likely to be Serb, folk would have thought him mad—or drunk. The pull was between Greek and Bulgar, there was no question of the Serbs. There was a large "Greek" population, both in town and country, but of these a very large proportion were Vlachs, many were South Albanians, others were Slavs. Few probably were genuine Greeks. But they belonged to the Greek branch of the Orthodox Church, and were reckoned Greek in the census. Those Slavs who called themselves Serbs, and the Serb schoolmasters who had come for propaganda purposes, all went to the Greek churches." ^ Ortaylı, İlber. "Son İmparatorluk Osmanlı (The Last Empire: Ottoman Empire)", İstanbul, Timaş Yayınları (Timaş Press), 2006. pp. 87–89. ISBN 975-263-490-7 (in Turkish). ^ Historical Dictionary of the Republic of Macedonia, Dimitar Bechev, Scarecrow Press, 2009, ISBN 0810862956, pp. 26-27. ^ Elsie, Robert (30 March 2010). Historical Dictionary of Albania. Scarecrow Press. p. 449. ISBN 978-0-8108-6188-6. Retrieved 29 May 2012. ^ Campbell, George L. (2000). Compendium of the World's Languages: Abaza to Kurdish. Taylor & Francis. p. 50. ISBN 978-0-415-20296-1. Retrieved 29 May 2012. ^ Dimitar Bechev, Historical Dictionary of the Republic of Macedonia, Historical Dictionaries of Europe, Scarecrow Press, 2009, ISBN 0810862956, p. 82. ^ "Last Century of a Sephardic Community - The Jews of Monastir, 1839-1943". www.sephardicstudies.org. ^ The settlements with muslim population in Macedonia. Logos-A. 2005. pp. 206–. ISBN 978-9989-58-155-7. ^ "И Албанија со почесен конзулат во Битола, конзул Имер Селмани" (in Macedonian). bitolanews.mk. January 16, 2019. ^ "ТВ ТЕРА". ТВ ТЕРА. Archived from the original on 2014-11-04. Retrieved 2014-11-04. ^ "Отворен почесен унгарски конзулат во Битола" (in Macedonian). Dnevnik.com.mk. October 18, 2012. Archived from the original on 2012-10-19. Retrieved 2012-10-18. ^ "Украина отвара почесен конзулат во Битола" (in Macedonian). Makfax.com.mk. December 9, 2011. ^ "Во Битола поради економски причини затворен Хрватскиот конзулат" (in Macedonian). emagazin.mk. May 20, 2014. Archived from the original on November 4, 2014. ^ "Затворен Генералниот конзулат на Словенија во Битола" (in Macedonian). libertas.mk. November 1, 2014. ^ "Затворен конзулатот на Велика Британија" (in Macedonian). tera.mk. June 9, 2014. Archived from the original on November 4, 2014. ^ "Поведена иницијатива за отворање италијански конзулат во Битола". ^ a b c d e f "Попис на Македонија" (PDF) (in Macedonian). Завод за статистика на Македонија. 2002. Retrieved 2012-05-26. ^ "Bitola joins the UNESCO Creative Cities Network". MIA. Retrieved 2018-10-03. ^ "Kardeş Şehirler". Bursa Büyükşehir Belediyesi Basın Koordinasyon Merkez. Tüm Hakları Saklıdır. Retrieved 2013-07-27. ^ "ТВ ТЕРА". ТВ ТЕРА. Archived from the original on 2015-01-02. Retrieved 2014-11-04. Wikimedia Commons has media related to Bitola. Wikivoyage has a travel guide for Bitola. Wikisource has the text of the 1911 Encyclopædia Britannica article Monastir.